The emigrant's destiny: The foreign country has not become home, but home has become foreign. Emigranten-Schicksal: Die Fremde ist nicht Heimat geworden. Aber die Heimat Fremde. Between 2007 and 2009, I lived in Los Angeles after living in Paris for many years. My Paris blog (before and after my Los Angeles sojourn) is Rue Rude. 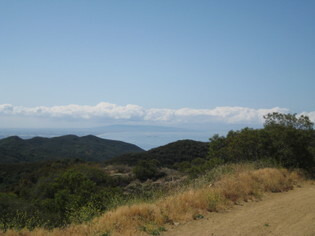 I went hiking up Trailer Canyon, in the Pacific Palisades Highlands. This is an expensive new neighborhood several miles from any kind of store or restaurant (I guess the servants do the shopping). All the houses are built in uniform Spanish-Colonial style and some of the streets are gated. 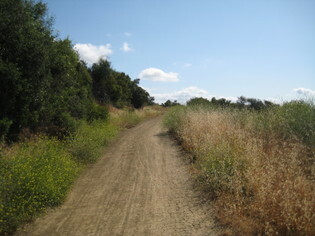 If you follow signs, you get to Trailer Canyon trailhead, walk up a steep bank, and soon come out onto a nice trail. 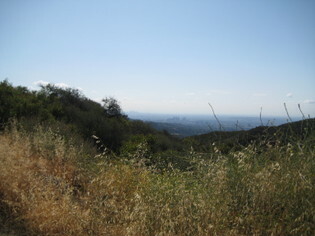 Later on, in the Santa Monica mountains, the trail becomes a wide fire road that is a favorite with mountain bikers. What I love about it are the views. In Paris, the purest virtue is the object of the filthiest slander. À Paris, la vertu la plus pure est l'objet des plus sales calomnies. Annual Geminids meteor shower (shooting stars!) coming this weekend, if it's not too cloudy out at night. Honestly, who could resist? Awww!